As I noted many times before, SEO is such a fast paced industry. So many news items, so many updates and changes every day. 1. 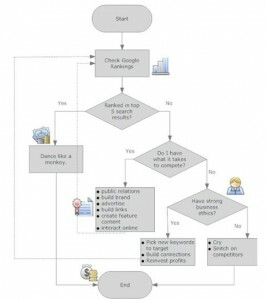 I would like to visualize the basic SEO process? Is there a great chart which helps me to understand it? Yes. Aaron Wall from infamous SEO Book created a impressive and very comprehensible chart, IMHO. The original PDF version can be downloaded here. 2. Is the bounce rate really a search engine ranking factor? Yes. At least Top SEO’s must now take bounce rate into account when designing and refining a site, SEO Blackhat writes. 3. Does a non-indexed page pass on PageRank? Surprisingly, yes. Dutch Search Marketer Eduard Blacquière received the answer through the LinkedIn group LinkedSEO. It said: “NoIndex is a request to not show the page in the results. PR still passes. NoFollow, PR doesn’t pass but does accumulate”. 4. How can I get 800,000 visits from Google.com in just 7 days? 5. Is the BrowseRank the new PageRank? Maybe. Marios Alexandrou from All Things SEM explains BrowseRank, a measure developed by Microsoft with the purpose of outperforming Google’s PageRank, in a very interesting post. 6. How do I build authority links (including .edu .gov .mil)? Saad Kamal reveals the secret in a very useful post. First, in order to find authority links: spy on your competitors Find out which .edu/.gov/.mil are linking to your competitor, with a command like “linkdomain:www.google.com site:edu”. Then get Links from .Edu/.Gov/.Mil blogs on your Niche, with a command like the following: “Keyword+inurl:blog site:.edu”. Saad offers many more great tips. 7. Can SEO and user generated content really be a good match for each other? Yes. Laura Callow delivers great insights on that, backed up by research and data. Among others, she writes that online comments and reviews posted by the enthusiasts are second only to word of mouth as a purchase driver for all web users. 8. Which are the Top 25 most powerful web directories? Paul Teitelmann from Search Engine People provides a fantastic list. It includes directories like World Site Index, Dmoz and Octopedia. 9. How to I avoid to screw up a change of my domain name? Danny Dover from SEOmoz has some valuable tips. Among others: Phase the transition. And don’t forget to tell the search engines. 10. Which are the best books on social media marketing? Lee Odden from the Online Marketing Blog wrote a great post with over 20 Must Read books about social media marketing. It includes “Cluetrain Manifesto“, “Groundswell”, Seth Godin’s “Tribes”, James Surowieki’s “The Wisdom Of Crowds” and Paul Gillin’s “Secrets of Social Media Marketing”. I am aware that this list could be ten times longer. Did I miss any of the “big stories” in SEO, in your opinion? Let me know!